New Delhi-Govt of India signed a loan deal worth $ 200 million with the World Bank for the National Nutrition Mission ,POSHAN Abhiyaan. 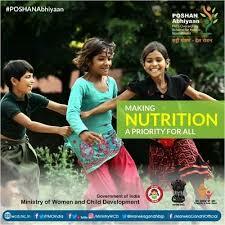 The loan would help the Government of India in achieving its goal of reducing stunting in children 0-6 years of age from 38.4% to 25% by the year 2022.The POSHAN Abhiyaan was launched by the Prime Minister on 8th March 2018 at Jhunjhunu, Rajasthan.A large component of POSHAN Abhiyaan involves gradual scaling-up of the interventions supported by the ongoing World Bank assisted Integrated Child Development Services Systems Strengthening and Nutrition Improvement Project to all districts in the country over a 3-year period. The loan approved will support the first phase scale up to 315 districts across all states and union territories.